The U.S. has lots of donut shops and chains, however I was curious if Washington state had any nearby specialty donut shops similar to Voodoo Donuts in Portland or Cartem’s in Vancouver. 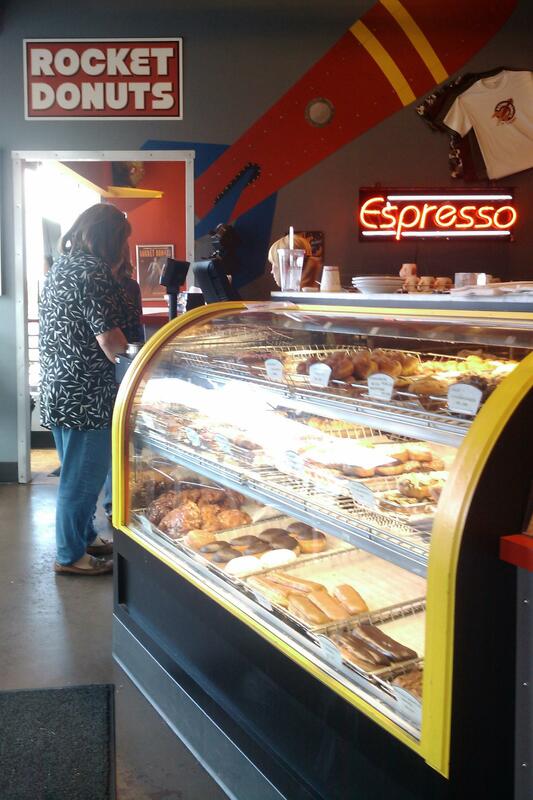 After a quick search, I found Rocket Donuts in downtown Bellingham via Urbanspoon. I drove across the border and arrived at the shop on a Friday afternoon for a visit. 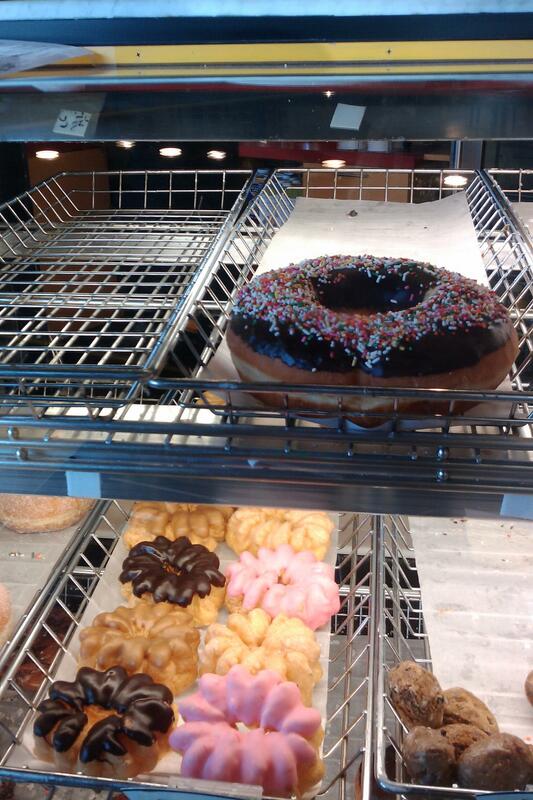 Do not expect a hole-in-the-wall type of place or a giant Tim Horton’s/Krispy Kreme styled shop. This place looked like a classy higher end bakery. They have free parking for customers and a giant rocket outside to welcome you. Upon arriving inside, a glass case full of donuts greets you, including one really giant donut – around 5x the size of a regular sized donut! There was quite a selection when I went so I had a hard time deciding. The counter staff was very helpful and friendly. She recommended that their best sellers were the Raised Glazed donut (which looks a lot like Tim Horton’s honey glazed donut, but bigger) and their fritters (which in size were at least twice the size of a Tim Horton’s fritter). 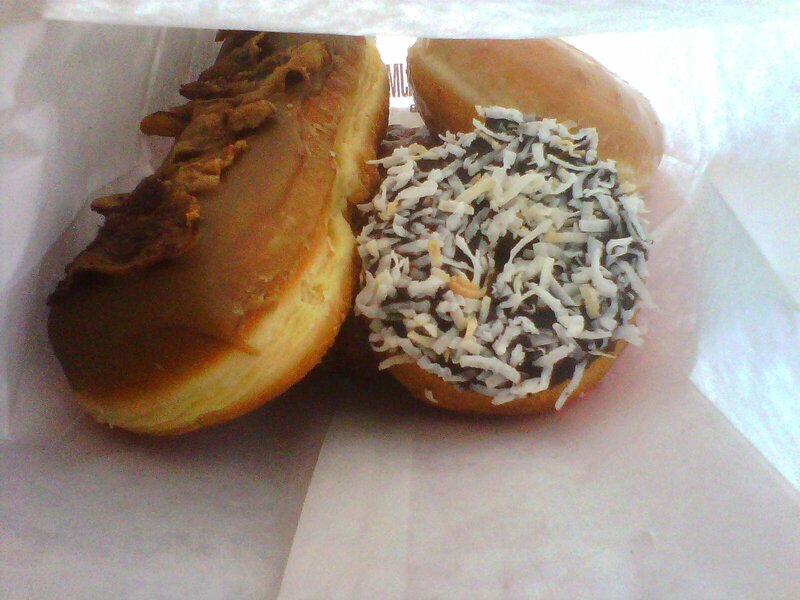 I left the store with the following donuts: Raised Glazed, Apple Fritter, Maple Bacon, and Coconut Cake. The Verdict: The following is ranked based on preference, most to least favorite. The Raised Glazed was delicious! Nice and fluffy soft when you bite into it. Not super sweet like Krispy Kreme. Definitely would buy again. 89 cents each definitely was a great deal too! According to their website, it’s only 180 calories. Apple Fritter was just as delicious as the Raised Glazed! Loved that it wasn’t too sweet. Plus I left it overnight and it still tasted really good. Not as soft as when it’s fresh, but still somewhat moist on the inside when you bite into it. Worth the $2 due to size and the amount of apple chunks inside. Bacon Maple Bar used a classic maple glaze with hickory smoked bacon strips. I really loved the hickory smoked flavor of the bacon. 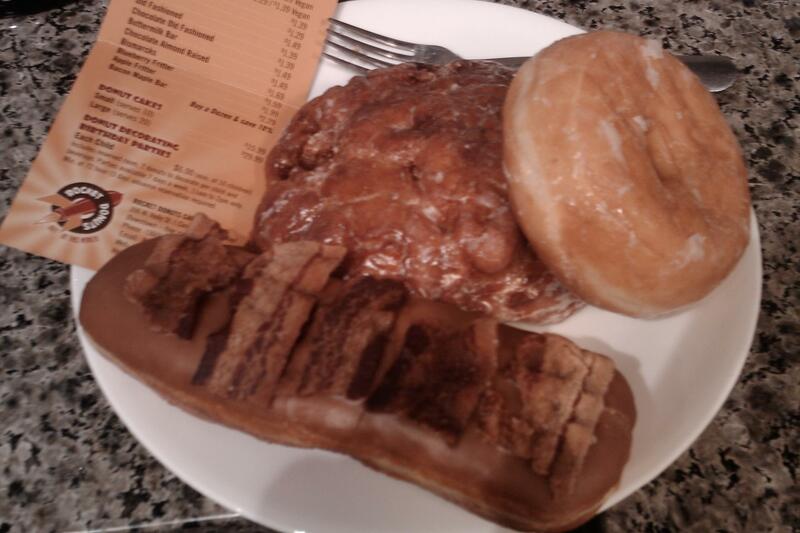 Every bite, I had some salty bacon added to the sweetness of the maple on the donut. A must try and for only $2.29! Coconut Cake was a donut made of cake batter, so it’s not as fluffy, a bit more textured like a cake, then dipped in chocolate with coconut sprinkles. I was not a huge fan of this donut as I found the donut to be too dense compared to the others. Would’ve preferred a Raised Glazed. Next time I’m going back to try some more flavors of their Raised donuts! They also carry ice cream, so perhaps try that out as well just for kicks.